No matter where you have them, trees eventually fall. 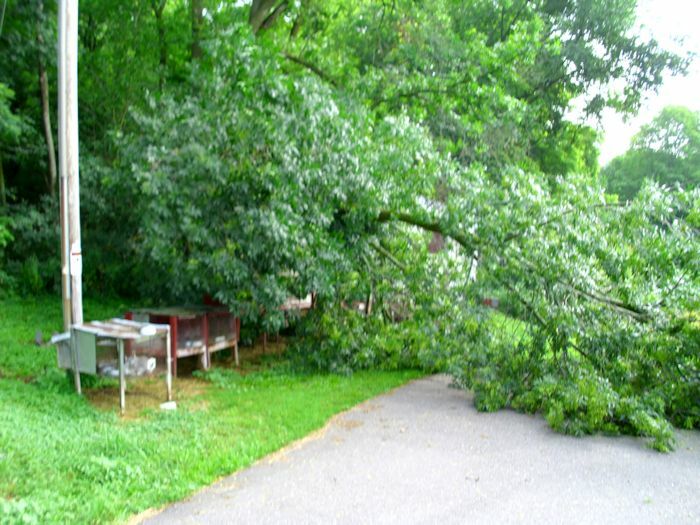 Parts of our property are heavily wooded, so falling trees are expected and happen fairly often. Winds will blow a tree down, lightning will crack it, insects will kill it, woodpeckers will weaken it, or old age will simply take it. No matter the cause, the tree lands somewhere and in most cases, the landing is benign from our perspective. 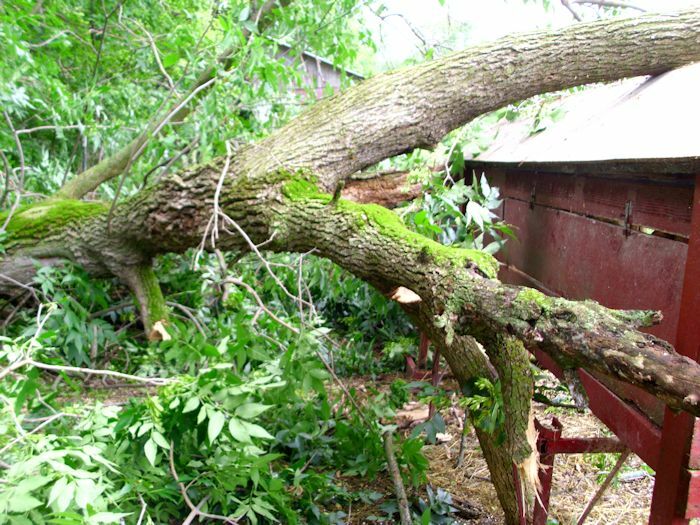 However, we recently experienced a less benign falling tree. The woodpeckers had weakened it, birds had nested in the holes, and carpenter ants had drilled a hole through the center. A lightning strike and high winds finished the job. 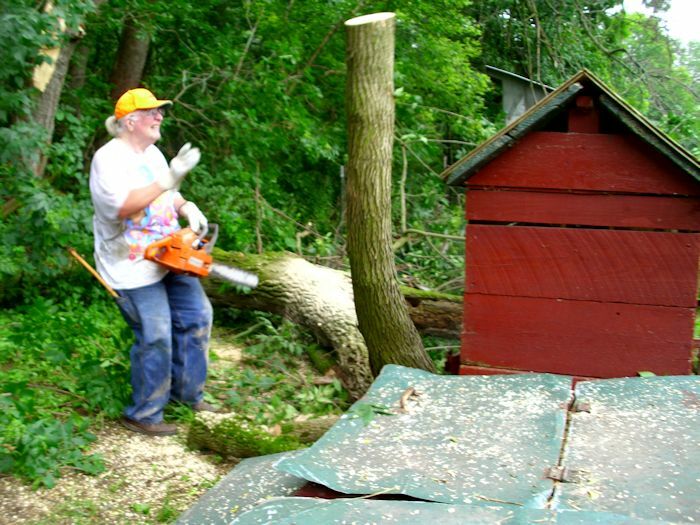 After the storm we got up to see a rather large tree draped across our rabbit hutches. Most of the pictures in this post were taken by my wife, Rebecca. I greatly appreciate her help in putting this post together. Our first thought was that the rabbits had escaped their hutch or were possibly dead. 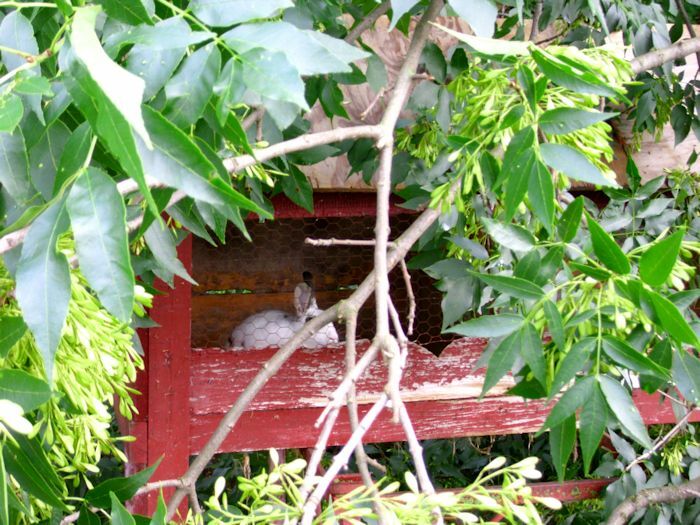 Amazingly, the rabbit hutch held and the rabbits were safe. The main problem was that we couldn’t get to them to feed them. 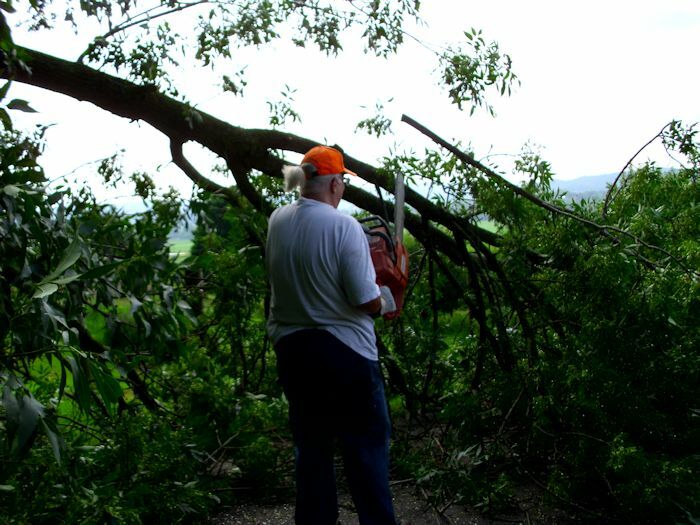 Unfortunately, cutting up a large tree is hot work and the heat index was well over 100 degrees that day (into the danger zone of the heat index chart). Let’s just say that it was sweaty work and leave it go at that. The tree was poised like a giant spring. The main trunk was actually split in two, but it was butted up against the rabbit cages in a way that didn’t let it fall completely, so I had to cut the tree with extreme care—starting with the branches. 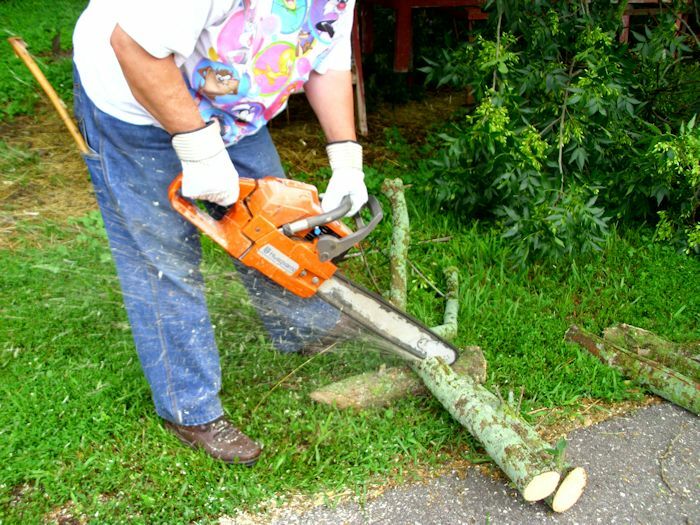 As I cut the branches, I separated the parts that I would later chip from those we would dry for firewood. The larger pieces were cut into lengths for stacking. After a while, all of the branches were cut. The tree was as safe as I could make it. However, the main part of the trunk was still braced against the rabbit hutch, so we still couldn’t get to the rabbits to feed them. The most challenging moment came when I had to release the spring holding the trunk against the cages. The cut was extremely dangerous because I had to cut the tree enough to release the pressure, but not so much that it would flip in some unexpected way. What I needed was a slow release of pressure so that the tree would come to a safer position. I made the cut and the tree slowly started to move as expected. The spring completely released itself and the piece I had partially cut ended up standing straight in the air before falling to the ground. I still have a lot of tree to cut, but we’ve managed to make use of everything. 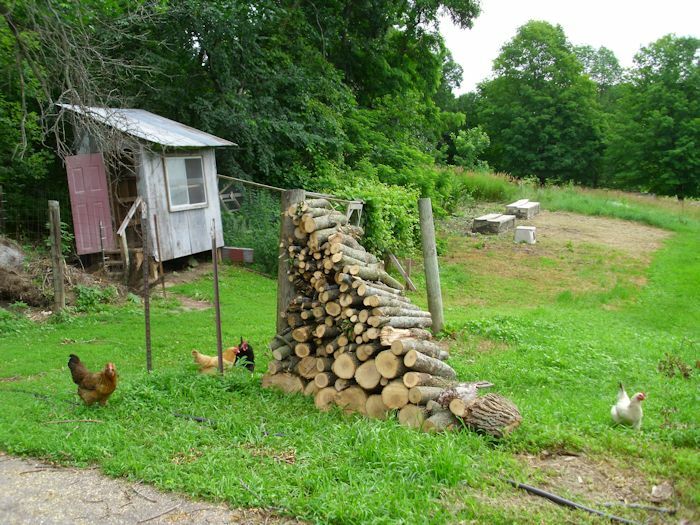 The pieces of the tree I have already cut up are stacked and drying nicely. 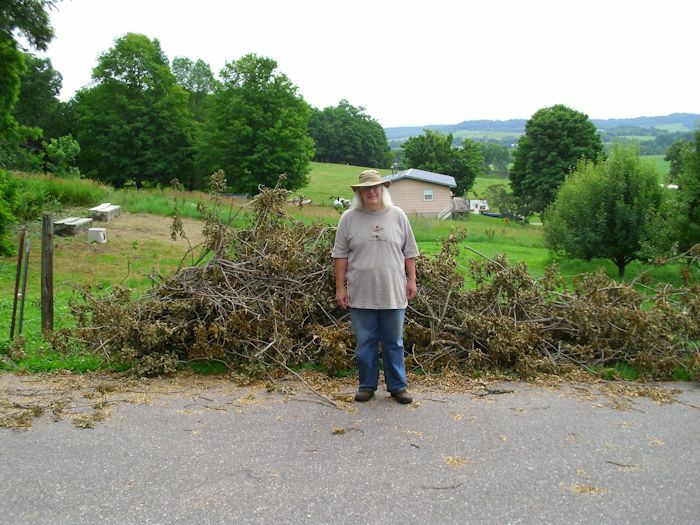 We also obtained a large stack of branches. A lot of people would create a huge brush pile from the branches and burn them. However, doing so is really bad for the environment and wasteful of a useful part of the tree. I’m currently chipping the branches up and using them for mulch on our grapes. 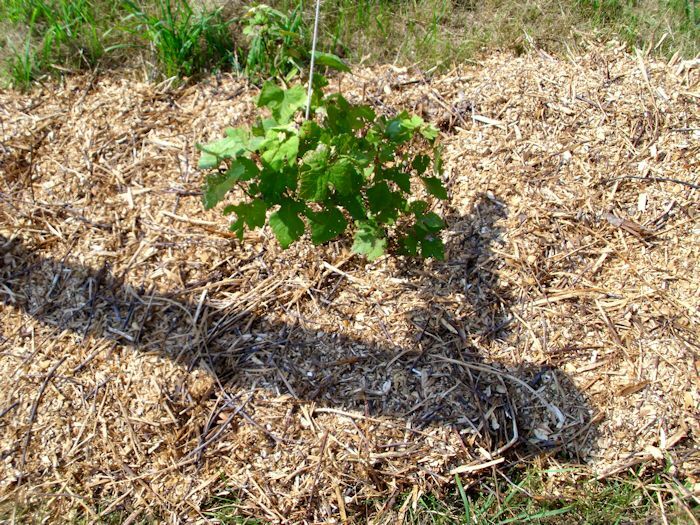 The mulch will keep the grapes moister, reduce watering costs, and make the grapes more productive because they won’t be battling weeds. In the end, what started as a disaster turned into an opportunity. Not every act of nature turns out this way, but we try to make the best of every situation. When did you last make an opportunity out of a natural event that started as a negative? Let me know at John@JohnMuellerBooks.com.